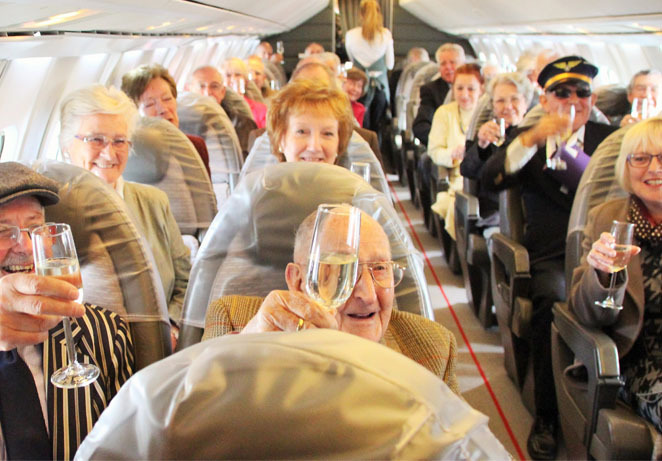 Discover what it was like to fly on Concorde, with a glass of Champagne in your hand. During this 2 hour tour, our Deluxe Concorde greatly enhances the standard Concorde Experience. The Members' Bar in the Brooklands Clubhouse will be your Departure Lounge, with tea or coffee and a 'pre-flight' briefing. Then it's time to board Concorde. Sit in a real Concorde seat and sip Champagne during your virtual flight. You'll then be invited to sit in the pilots' seats on Concorde's Flight Deck. Finally, spend time in the Concorde Simulator, as she takes off from London Heathrow, flies a low-level pass over Brooklands, and lands back at Heathrow. Places must be booked in advance for this event. Welcome Reception in the Members' Bar with tea and coffee. Champagne served to you on Concorde. Visit to the Concorde Simulator.